Yesterday, I took a short train ride east to Dallas to join my some of my Dallas Modern Quilt Guild friends and enjoy the Dallas Quilt Show. These girls are too much fun, as evidenced above by the priceless greeting I received as I stepped off the train. After a big breakfast at the delicious greasy spoon, Mama's Daughters Diner, we were off to the show. I did exceptionally well showing restraint while shopping (see, I only bought a few FQs), but an antique quilt dealer from Austin had some inexpensive quilt goodies I could not resist. One of my purchases was a large bag of quilt scraps for $4. They really are scraps, but I knew there would be something in there I could work with. Last night, I sewed the scraps together by butting the freshly cut edges together and zig-zag stitching over the join with some fabric on the backside to help stabilize the seam. Here's the finished mini-quilt; it's just under 15" square. I had enough of the red floral (with it's original binding attached!) to use as the outside once I pieced a little of it together. I love that it has all of it's original hand stitching and batting inside. As for the quilt show, we had a wonderful day and even ended up back at the diner for some pie in the afternoon. Thanks for letting me hang out with you girls! Oh...I love it!! That was by far my favorite booth. But I missed the pie! BOO! I love it! Looks great! I was very sad to not be able to make the 1,000 mile trek south to the show this year. I usually go down every year and visit my mom and we do the show. Hopeful to make it next year. Have a great weekend! 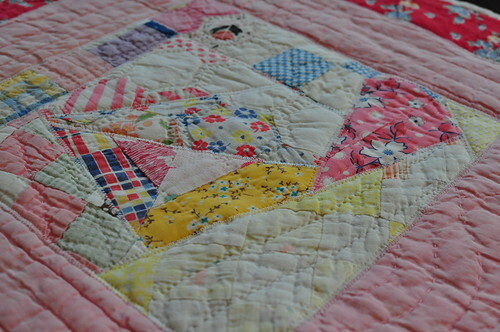 wow...i adore your vintage mini quilt. very inspiring!! Ohhh. I love that mini quilt so much!!! I hope I will be well enough next year to go to the show. That mini quilt is awesome! I could have never come up with something that clever from those scraps. Hey! I was there on Friday. My aunt took me for my birthday. 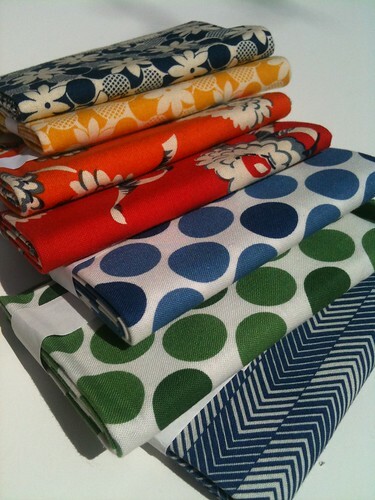 We had a good time and I found some great fabric that I didn't even know I needed. I ate at Mama's Daughter's Diner all the time while preggers with my first born. Haven't been in a long time. Love it! 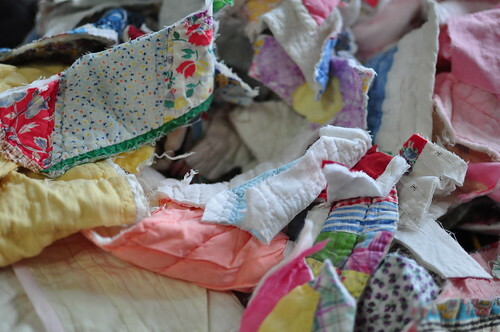 I have pieces of a 1930's quilt my Grandma made and this is a great idea to make a quilt out of what still survives--I've already made a doll blanket and used one block on a tote bag but can't bear to throw away the rest! As always...you rock Melanie! It's inspiring to be around you and ALL our quilting friends! 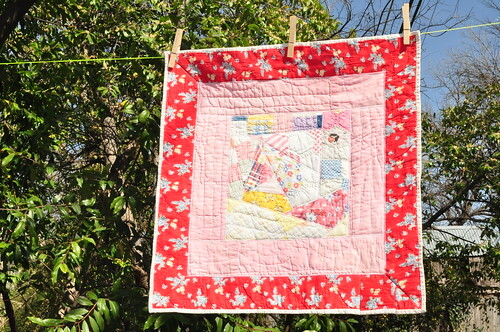 Thanks for sharing the mini-scraps quilt. I have an old quilt with ragged edges that this might just be the solution for.